Compatible with our standard transmitter, XT Racing's Ducati I/R is designed to work with the stock lap timers that come fitted on the 749, 848, 999, 1098, 1198, Hypermotard and D16RR models. Simply plug it in, mount it, set your dash to 'LAP ON' and the Ducati I/R will automatically trigger the on-board timing system when you cross the transmitter's beam. The only aftermarket Ducati trigger, the Ducati I/R weighs in at a fraction of the cost of Ducati official I/R (about $1000). Milled from billet aluminum and fitted with an 18" cable, the Ducati I/R can be mounted on either side of your bike. The Ducati I/R packs the same reliability and functionality you've come to expect from other XT Racing products without emptying your wallet. You'll wonder how you ever raced without one. XT Racing is proud to introduce the newest in its line of precision racing equipment, the GPX Pro. Packed with features designed to give you superior insight into your time on the race track, the GPX Pro isn't just a lap timer, it's a professional-grade racing tool with the club racer's budget in mind. At XT Racing, we understand that in order to be a valuable tool, the GPX Pro needs to be versatile enough to log the data a racer wants while being adaptable enough to handle many different forms of racing. With the GPX, you don't have to wonder if it was designed for your kind of racing. At up to 4 channels of data acquisition and with four separate racing modes, the GPX assures that if it can be raced, a GPX belongs on it. The GPX is literally jam packed with features previously found in models hundreds of dollars more expensive. At XT Racing, we understand that in order to be a valuable tool, the GPX Pro needs to be versatile enough to log the data a racer wants while being adaptable enough to handle many different forms of racing. With the GPX, you don't have to wonder if it was designed for your kind of racing. At up to 8 channels of data acquisition and with four separate racing modes, the GPX assures that if it can be raced, a GPX belongs on it. The Mini-Lap is a scaled-down version of its counterpart, the Ultra-Lap, the Mini-Lap is intended to provide the user with the basic tools needed to time your laps at the track. The Mini-Lap is housed within a single, molded plastic box and comes equipped with dual-sided infra-red pickups so that it can receive transmitter signals from either side of the race track. While it only stores up to 40 laps, it comes in much cheaper than the Ultra-Lap and is ideal for session-by-session lap timing. Why race with less when you can have the best? Ultra-Lap is your partner in performance, combining the latest technology with the racing knowledge you need to gain competitive advantage. Active design participation and testing by racers such as yourself ensure that Ultra-Lap offers the specialized features that you've been looking for in a better, more intelligent lap timer. That's why racers such as you are quickly moving to Ultra-Lap, the electronic "coach in a box." Ultra-Lap combines the latest technology with the racing knowledge you need to gain competitive advantage. More features and fewer headaches make Ultra-Lap the premier lap timing device, and your partner in performance with a full season's worth of racing right at your fingertips. Accurate to 1/100 second per lap, the Ultra-Lap automatically signals whether your last lap was faster or slower than the previous one and can also be easily programmed to track and report on the measures that are most important to your individual success. Imagine being able to analyze a full season of racing, clearly identified by track or weather! Ultra-Lap's performance is extended even further through its personalization capabilities (including owner identification) and ability to track up to 2,000 laps/split times with unique identifiers associated with each. Ultra-Lap is easy to use and program, and can be returned to factory settings at any time with just the push of a button. VRLA (Valve Regulated Lead Acid) means a battery that's perfect for people who have better things to do than battery maintenance. 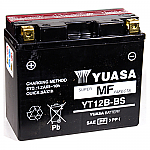 Yuasa's permanently sealed VRLA battery never needs refilling; however, it still needs periodic charging. Ideal for motorcycles, scooters, ATVs, riding mowers and watercraft. Spill-proof design means virtually no possibility of leaks (after proper activation and cycling). Advanced lead-calcium technology pumps up starting power. Sulfation retardant dramatically reduces battery-killing plate sulfation. Long lasting which means Yuasa's High Performance Maintenance Free batteries will last up to three times longer than conventional batteries. Exceptional resistance to vibration makes Yuasa the most reliable battery on the market today. And, VRLA batteries hold voltage longer and need less charging in standby or storage mode.